The Dry Bulb, Wet Bulb and Dew Point temperatures are important to determine the state of humid air. The knowledge of only two of these values is enough to determine the state of the moist air - including the content of water vapor and the sensible and latent energy (enthalpy) in the air. The Dry Bulb temperature, usually referred to as "air temperature", is the air property that is most commonly used. When people refer to the temperature of the air they are normally referring to the dry bulb temperature. The Dry Bulb Temperature refers basically to the ambient air temperature. It is called "Dry Bulb" because the air temperature is indicated by a thermometer not affected by the moisture of the air. Dry-bulb temperature - Tdb, can be measured using a normal thermometer freely exposed to the air but shielded from radiation and moisture. The temperature is usually given in degrees Celsius (oC) or degrees Fahrenheit (oF). The SI unit is Kelvin (K). Zero Kelvin equals to -273oC. 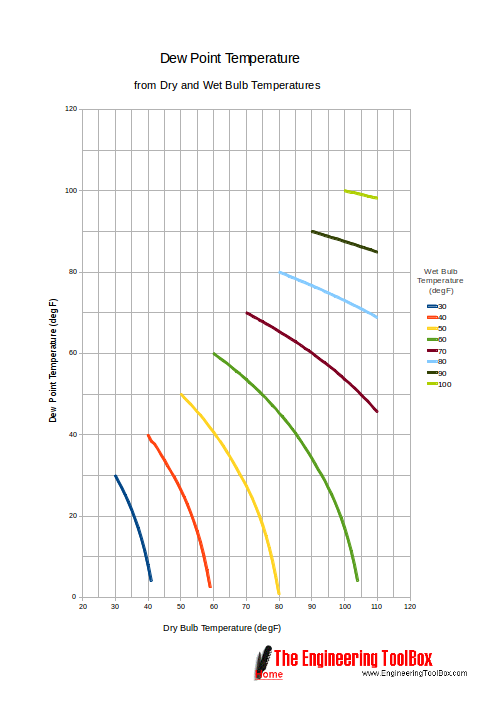 The dry-bulb temperature is an indicator of heat content and is shown along the bottom axis of the psychrometric chart or along the left side of the Mollier diagram. 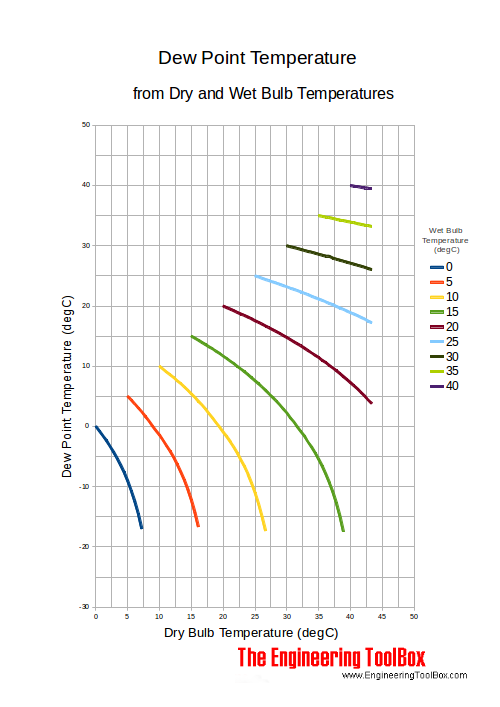 Constant dry bulb temperatures appear as vertical lines in the psychrometric chart or horizontal lines in the Mollier diagram. The Wet Bulb temperature is the adiabatic saturation temperature. Wet Bulb temperature can be measured by using a thermometer with the bulb wrapped in wet muslin. The adiabatic evaporation of water from the thermometer bulb and the cooling effect is indicated by a "wet bulb temperature" lower than the "dry bulb temperature" in the air. The rate of evaporation from the wet bandage on the bulb, and the temperature difference between the dry bulb and wet bulb, depends on the humidity of the air. The evaporation from the wet muslin is reduced when air contains more water vapor. The Wet Bulb temperature is always between the Dry Bulb temperature and the Dew Point. For the wet bulb, there is a dynamic equilibrium between heat gained because the wet bulb is cooler than the surrounding air and heat lost because of evaporation. The wet bulb temperature is the temperature of an object that can be achieved through evaporative cooling, assuming good air flow and that the ambient air temperature remains the same. By combining the dry bulb and wet bulb temperature in a psychrometric chart or Mollier diagram the state of the humid air can be determined. Lines of constant wet bulb temperatures run diagonally from the upper left to the lower right in the Psychrometric chart. If moisture condenses on a cold bottle taken from the refrigerator the dew-point temperature of the air is above the temperature in the refrigerator. The Dew Point temperature is always lower than the Dry Bulb temperature and will be identical with 100% relative humidity (the air is at the saturation line). As air temperature changes the Dew Point tends to remain constant unless water is added or removed from the air. The Dew Point is given by the saturation line in the psychrometric chart. Dew point temperatures from dry and wet bulb temperatures are indicated in the charts below. Engineering ToolBox, (2004). Dry Bulb, Wet Bulb and Dew Point Temperatures. 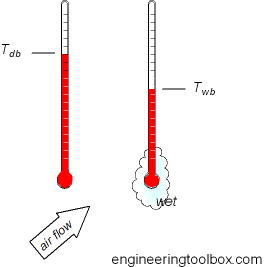 [online] Available at: https://www.engineeringtoolbox.com/dry-wet-bulb-dew-point-air-d_682.html [Accessed Day Mo. Year].